Looking for effortless elegance? Just step straight into our sleek heeled boots. The slender V-cut shape elongates your legs for a graceful look that's comfortable too. A wide heel, leather padded insoles and contrasting grosgrain back tape make these the ideal party shoes for your dancing feet. These sleek trousers are made from luxurious, silk-blend velvet with a subtle contrasting side panel. The wide-leg design is timelessly flattering and perfectly paired with a pair of heels. So where are these cocktails? Make an entrance in these bold, bright wide-leg trousers. Crafted from lightweight satin-backed crepe fabric for an elegant drape, they feature a shiny contrast waistband and pocket detailing. The long leg is perfect for pairing with your favourite heels for cocktails with the girls. Sports-luxe style, soft Italian wool blend and a flattering wide-leg shape – what’s not to love with our smart-casual trousers? A striped trim down the side adds a bold pop of colour, while a concealed hook-and-bar fastening and side slit pockets keep it sleek. Day-to-night has never been so simple. Your effortless go-to pair to wear with wedges or pumps. We've made them wide from the hip to the feet for a supremely flattering cut. You can rest assured that these will do the ‘don’t I look great today?’ job nicely. Statement side stripes? Check. Flattering wide-leg shape? Check. Easy to wear? Double check. Our pinstripe trousers cover all wardrobe bases. Pair with trainers for an easy-going brunch outfit, team with heels for sports-luxe chic, or go for full-on power-suit appeal with the matching blazer. These paperbag trousers are the luxurious trend piece your wardrobe has been missing. They’re crafted from a soft, Italian wool-blend fabric, so they feel comfortable while looking stylish. A high-waisted, wide-leg shape and belt ensure a flattering fit. We're fully on board with the wide-leg trouser trend. The wide-leg fit creates a flattering shape, while the ponte fabric looks smart and structured (hello, office wardrobe), yet feels oh-so comfortable. Now that's what you call win-win. This is British heritage at its finest. With tweed sourced from Yorkshire's historic Abraham Moon & Sons mill. 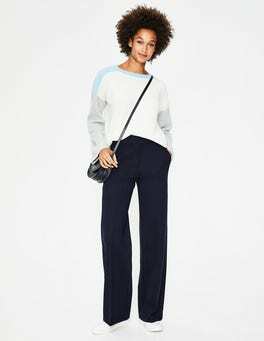 The wide-leg cut is universally flattering – especially when paired with a slim-fit top – while you can banish any fears about itchy fabric: these trousers are seriously soft. In style and on time? Well, we can help with one of those. Our wide-leg trousers are boardroom-worthy with smart panel detailing at each side. In a wool-blend fabric, they have a fluid drape that will flow on through from client meeting to celebratory cocktails afterwards. Florals and frills – there's never been a prettier pairing. This dreamy top is crafted from floaty fully lined georgette, with subtle ruffle details and a dainty keyhole fastening. Tucked into wide leg trousers, it's occasion dressing made easy. Now, where did you leave that RSVP? Try a different take on tailoring with these wide-leg trousers, complete with satin side stripes for a contrasting texture. The lightweight fabric hangs like a dream and flatters your shape. Pair with a simple silk shirt and heels for easy elegance. Mix one part comfort with one part chic, and what do you get? These wide-leg trousers. The trusty ponte fabric means they'll hold their shape, while the on-trend side stripe detail adds a contrasting pop of colour. Pair with heels and own that meeting. These floaty linen-and-cotton culottes should be the first thing in and the first thing out of your suitcase. The hook-and-bar fastening makes for flattering lines and the fitted waist flares out into statement wide legs. They look just the part with heels or sandals, for sunny holidays and beyond. The trend for jumpsuits is still going strong – and we’re particularly enamoured with this wide-leg version. A close-cut waistband, lightweight drapey crepe fabric and darts create a tailored shape, and there’s even hidden side pockets. We. Love. These soft silk blend velvet culottes will never disappoint. With a wide-leg shape and drapey fit, they’re easy to wear and super comfortable. This piece provides relaxed tailoring that is always party-ready. …ditsy floral print, a daring plunge V neckline, delicate eyelash ruffle trim, sheer sleeves and a keyhole opening at the back. The bottom half: a flattering wide cut, cropped like culottes, in bold-striped, drapey Crêpe de Chine. All this piece needs is killer heels and a ‘let’s party’ clutch. Chase the sun in our soft and lightweight linen-and-cotton shorts. The tie waist at the front is smart enough for the hotel bar, while the comfortable fit keeps you nimble for running along the beach. Pair with your favourite tee and don't forget your sunnies. These supersoft cotton-blend trousers are fitted at the hip and wide at the leg. In other words, they're incredibly flattering. Mock horn buttons and stitch detailing add the finishing touches to a stylish cut. We guarantee you'll love these leg-elongating trousers. With front- pressed creases and a flattering wide leg, they're your shortcut to sophisticated style. In comfortable ponte fabric, they're as comfortable as wearing leggings but smart enough for the office. It doesn't get much better than this. Turn up the comfort (literally) with these trousers. Made from a supremely soft cotton twill, they've got a relaxed, cropped wide leg for off-duty chic. These eye-catching culottes combine sporty with sailor-y (yep, that's a word now). The lightweight crepe fabric means they drape beautifully and the contrasting side seams add a pop of colour. The cropped length is perfect for pairing with strappy sandals for a weekend lunch date. Stroll through sunny streets in these glamorous palazzo-style trousers. Crafted in a lightweight, drapey fabric these stylish wide legs will keep you cool during the heat of the day. These hotchpotch culottes are cut in a classic, wide-leg shape. Made from a soft floaty fabric for a super-flattering look, they provide relaxed tailoring that is always party-ready. There's so much to love about this sleeveless jumpsuit: the pretty ruffles, the fitted waist, the elegant wide legs. The drapey, wrinkle-free fabric knows how to work every occasion, without a crease in sight. Try it on, you're guaranteed to fall for it. There's always room in the wardrobe for an extra pair of jeans – especially ones that feel this comfortable. Featuring a high waist and stitch detailing at the hem, the wide-leg design masters flattering and feminine in one fell swoop. Sunny day? With this lightweight jumpsuit on call you can stay all kinds of cool. It's cut from a naturally breathable linen blend that's made even breezier by the sleeveless, V-neck style. The fitted waistband and wide culotte legs mean you'll feel comfortable even when the weather's heating up. These lightweight trousers are 100% linen and 1000% chic. The wide-leg shape flatters the figure and is ideal for balancing out fitted tops. Button detailing on the side adds a smart slant – ideal for transitioning from post-siesta cocktails to late-evening meals on holiday. On the weekend, comfort is pretty much our number one priority. Kick back in this soft cotton T-shirt which has a versatile relaxed fit. Style it up with black skinnies or down with wide-leg jeans and trainers. Hello, lazy Sundays. Hello, stylish details (deep cuffs, notch neck, cinching tie belt). Good riddance, outfit-agonising and top-retucking. Whether you’re new to jumpsuits or have a wardrobeful of them already, this versatile, flatteringly feminine wide-leg version in soft, lightweight fabric has your name on it. This embroidered jumpsuit comes out of your suitcase in perfect shape thanks to the soft, lightweight crinkled fabric. The intricate floral embellishment, wide-leg design and blouson sleeves were created specially for sunset strolls on the beach and dinner on the terrace. Made from glossy crepe as part of our occasion range, these spotty wide-leg trousers bring shape and shimmer to your outfit. The satin-backed material feels super smooth and has a flowing drape. Just add a silk cami and strappy heels to nail that evening dress code. …of effortless elegance. 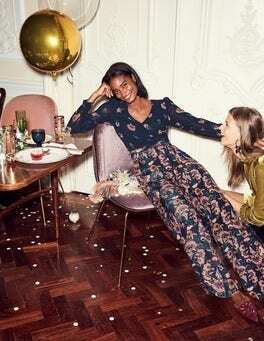 Now open them – and you'll see this feminine jumpsuit. The lightweight silk georgette brings fluid movement and a flattering drape to culotte legs and blouson sleeves. With a keyhole opening at the back and a relaxed tie belt, it's got carefree refinement all wrapped up.